First, this is a public service rather than the standard gripping entertainment. 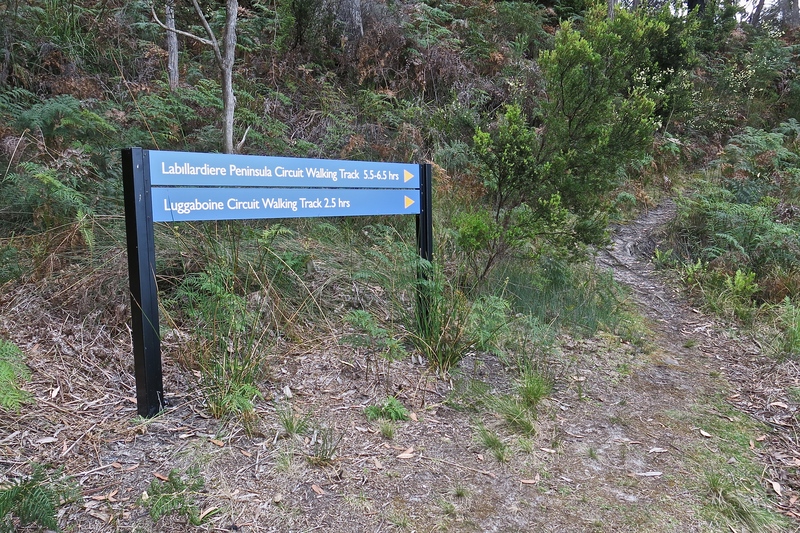 After finding an official-looking correction in our Bruny Island rental premises indicating that the Labilladiere walk was not 14 kilometres but 18, and not 5 hours but 7, I spent an hour on the net looking for information about which I could be confident and failing to find it: could have been five hours, or eight; could have been 12 k.s or 28. There’s a lot of cups of tea difference in those figures. As it is, the finger post immediately behind this sign says 5.5 – 6.5 hours rather than what’s here. The maps were generally execrable. The scale on one suggested about 8 k.s all up. The most common map, on the Island brochure, suggests a mystery gap of about 2 k.s between where the track is supposed to start and ah… where it does start. So this is an effort to provide reasonably accurate up to date information about this very pleasant walk: times, directions and what to expect. Second (even though his actual patronymic was Houtou), ‘Larbi-yardi-air’. It makes it easier to remember. Jacques L. (at left) was the naturalist on Bruny (or really Antoine Bruni, below) d‘Entrecasteaux’s voyage to try to establish what had happened to Lapérouse. (A failure. Authentic remains were subsequently found on an island not far from Vanuatu.) Larbi-yardi-air made a number of major contributions to the collection and description of zoological, botanical and geological specimens novel to Europeans. Tasmania provided a party in this regard. Despite what the board pictured above says, the walk circumambulating the Peninsula is probably a bit more than 14 k.s but not more than 16; and it took us a bit over six hours with two long breaks, or close to five hours of steady walking. There is, as occasionally advertised, a steep section over Mount Bleak gaining about 130 meters, but it’s short and the track is quite nicely graded. The rest is the very definition of ‘medium’. If it wasn’t quite as long it would be ‘easy’. Painless exercise in a delightful environment. While there is water at the camp ground, there is none available on the track. 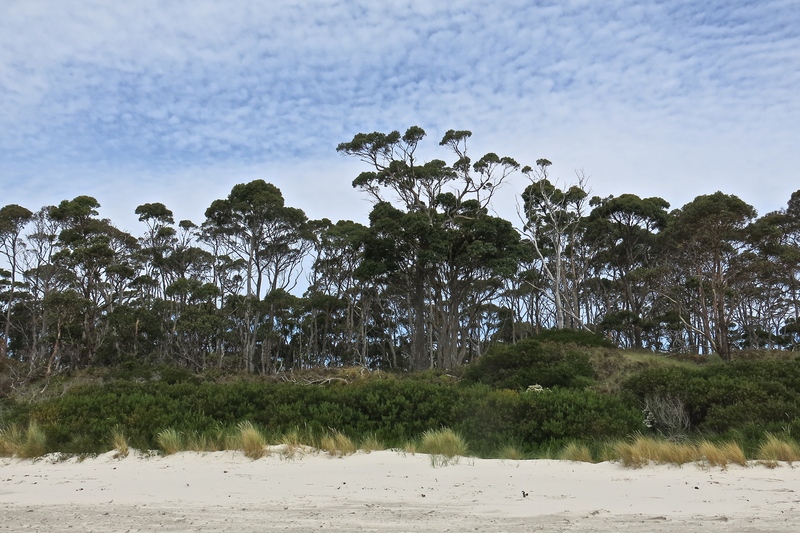 The track traverses four distinct environments: heathland, very thick bracken, beach walking, and a sandy littoral track through reasonably open grey stringy-bark forest. The one thing about which there is absolute consensus is that the walk, a circuit, should be done clockwise. I agree, but not emphatically. 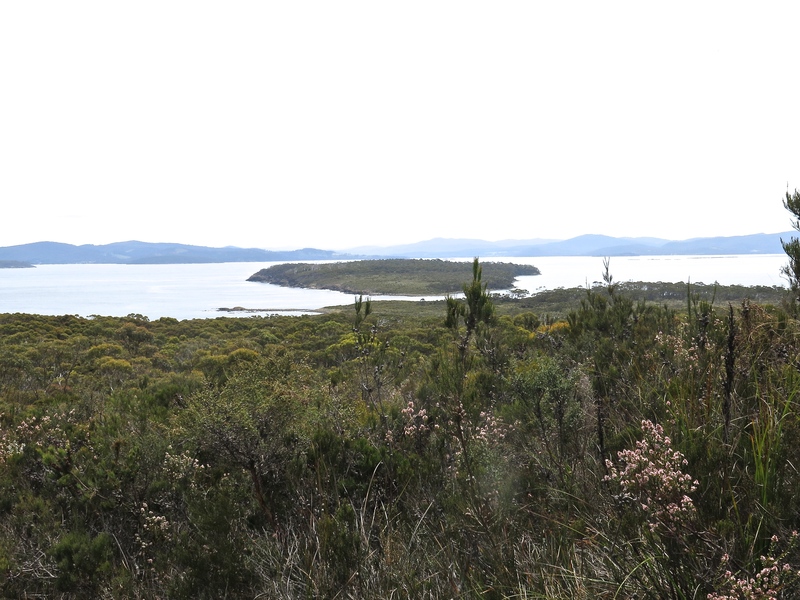 On the first north-westerly leg, clockwise does give you an intermittent series of long and attractive views over the beginning of the d‘Entrecasteaux channel, the coastline of the peninsula and the mountains of the southern range including Hartz Peak lowering away over in the background. On the other side direction wouldn’t make much difference. 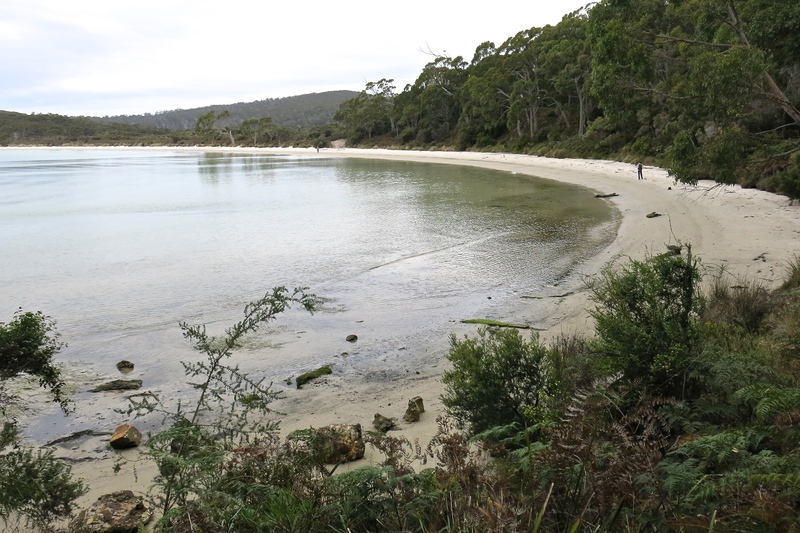 The track starts at the car park in the Old Jetty camping ground at the very southern end of Bruny Island. 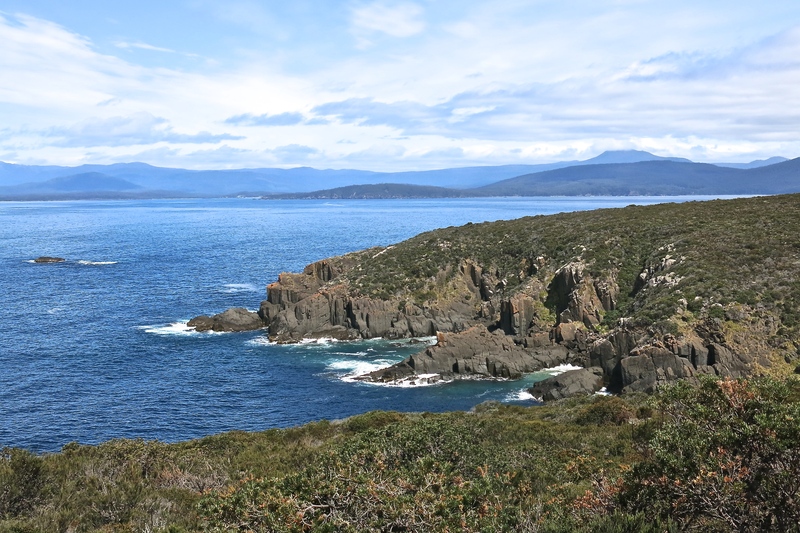 (The Jetty served for decades as the access point for getting supplies to Bruny Lighthouse keepers.) Allow at least an hour and quarter for the drive from the ferry dock. And you can actually park at the track entrance in something helpfully called ‘Track car park’. And if that’s what you want to do, start here. You walk a couple of hundred metres and are confronted by a choice. 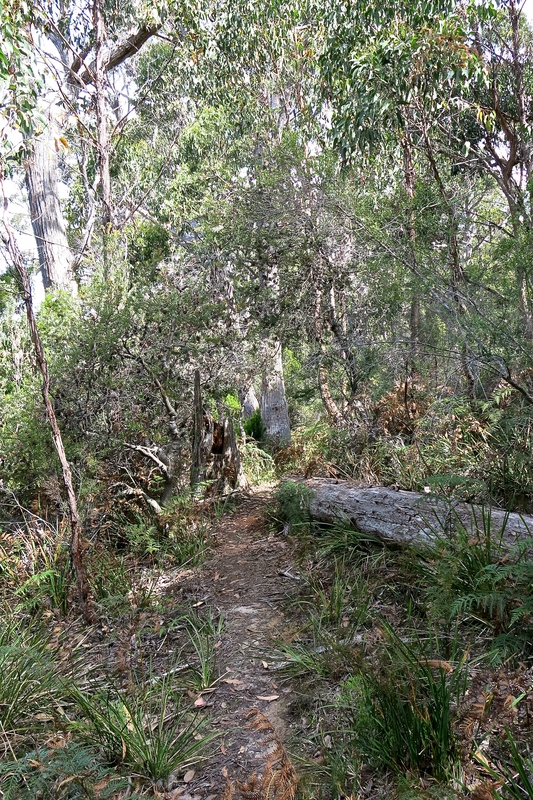 You hit a fire trail which will eventually take you almost the whole length of the walk on that side of the peninsula. (There’s a footpad over the hill.) If you’re me, there is some inclination to turn left because you’re a bit turned around by the drive in and you feel a (valid) need to cross the peninsula — and that might be the way. But it’s not. Turn right. That’s the last unguided directional decision you will need to make for the whole walk. After 20-30 minutes you will come to a clearly signed option to turn right for the shorter Luggaboine Circuit (about 2.5 hours). This was described by the owner of the Adventure Bay general store as ‘the same, but shorter.’ Your choice. 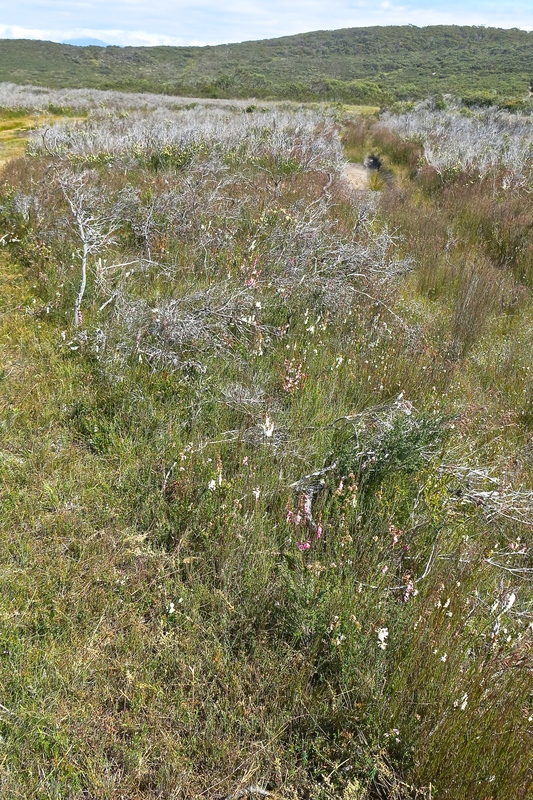 You’ve been walking through heath, sections of which are well above head height and some of which is waist high with the consequent effects on the view. In late November, and slightly past its best, this still provided a floral wonderland with hundreds of various types of orchids. In the longer views you can trace the course of the track as it wanders up and down over what looks like dune formations. There are two picturesque rocky beaches one of which, Hen and Chicken Rocks, is close to the track. The birdlife was exceptional all the way. After about an hour and three-quarters, and just past Hen and Chicken Rocks, you will come to Mt Bleak. It took us about 15-20 minutes to get to the top. Views from the top are incidental rather than pronounced — you are still in fairly thick vegetation — but what you can see is lovely. It is an easy descent from there towards Partridge Island which is appended to the tip of the peninsula. It took us a bit longer than I thought it would and if I’d been patient for another 5 minutes we could have had lunch at Hopwood’s Beach rather than parked on the side of the fire trail. This is after about two and three-quarter hours. 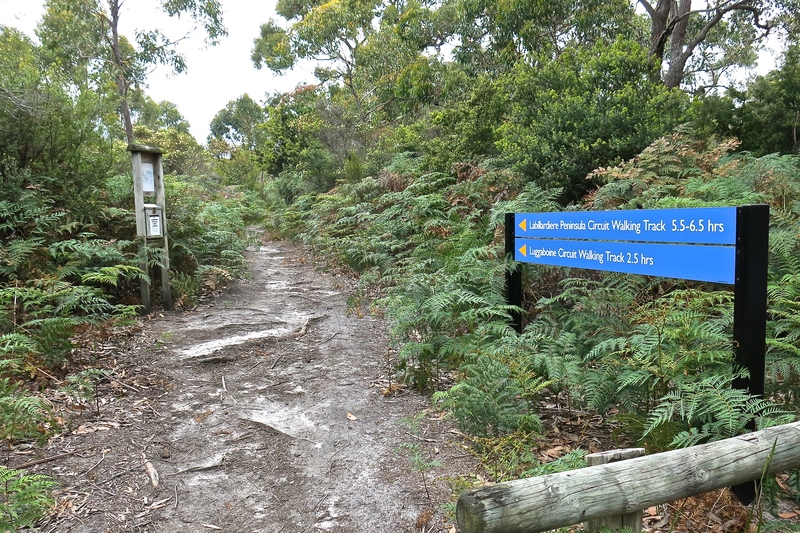 You climb out of the bush onto the beach for 200 or so metres before the signed entry to the trail on the other side. Then it’s about 15-20 minutes through some very dense vegetation with a lot of bracken where the track aperture is about shoulder-wide. 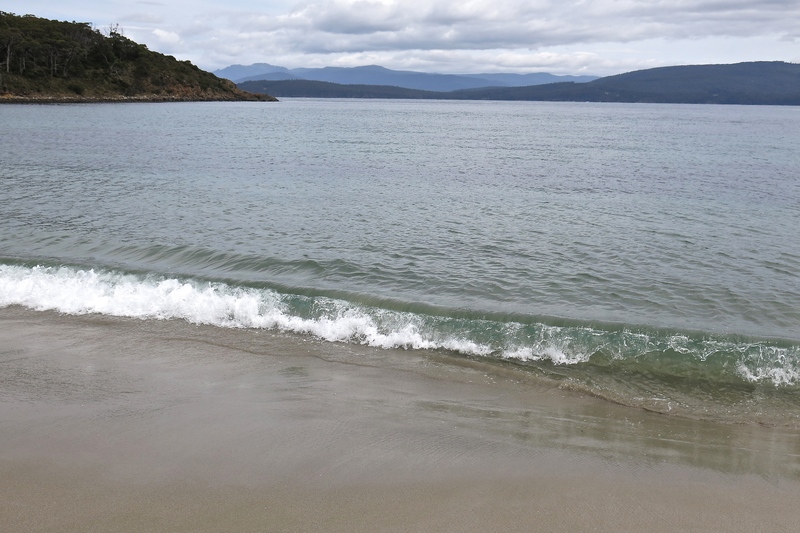 I’d already nearly trodden on a two-metre black snake and I was pleased to get out onto Butler’s Beach. Below: this was after it had thinned out considerably. You’ve turned the corner by now and the track takes you perhaps a bit over a k. on reasonably solid sand with lovely views. Up off the beach, again well signed — in fact once you actually get there the signage and information are fine. 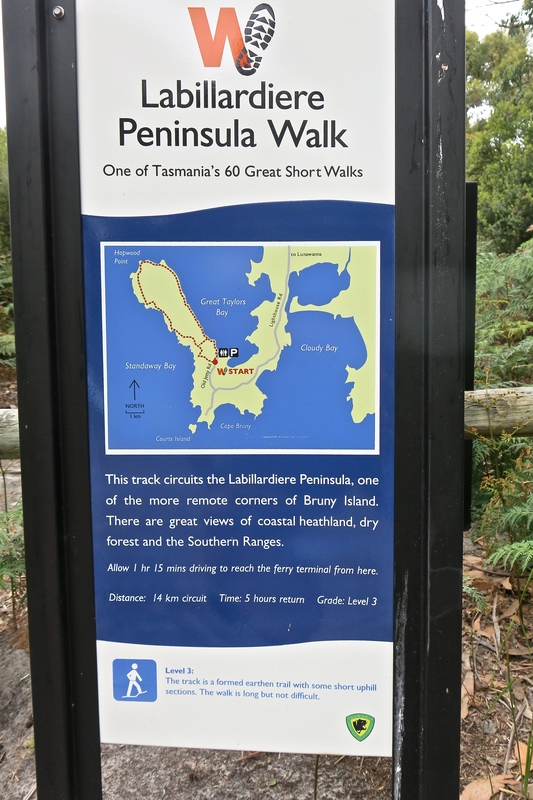 Then a bit less than two hours of trucking through open stringy-bark forest along a gently undulating sandy track (with occasional patches of roots and rocks just to remind you that you’re in Tassie) sticking with the littoral at not much less than footpath pace. About 25 minutes from home, you’ll come to this, the second intersection with the Luggaboine Circuit. And this is the end. Note the track off the other end of the beach for the light house provisioning. A shack with better than very nice views at Alonnah called ‘The Don’. 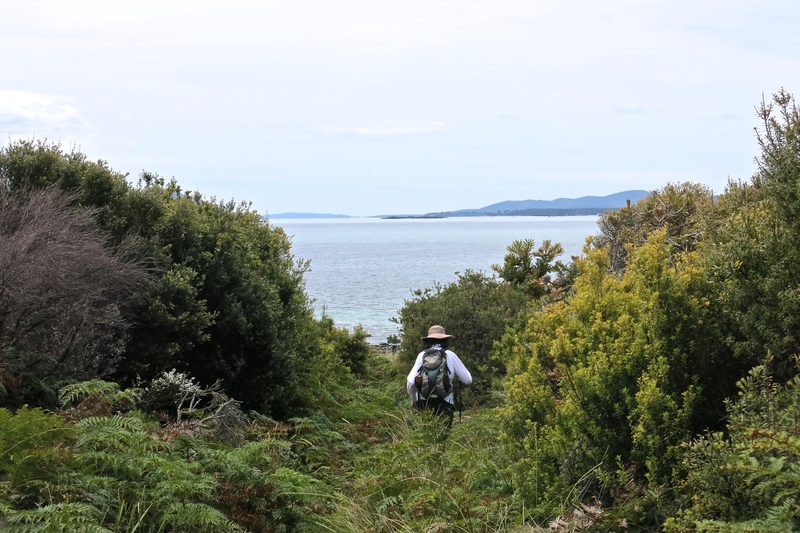 David, Ruth has just returned from a trip to Bruny Island with WWW (Women Who Walk) but they didn’t do this walk. It looked a bit daunting and they weren’t sure about the distance.